Miltenyi Biotec offers highly defined cell culture reagents that ensure reliable cell culture results. Recombinant Human Fibronectin (Fragment), premium grade is a defined extracellular matrix protein perfectly suited for supporting cell attachment in various applications such as culture of primary endothelial cells, mesenchymal stem cells, or stem cell derivatives such as cardiomyocytes or neuronal cells. 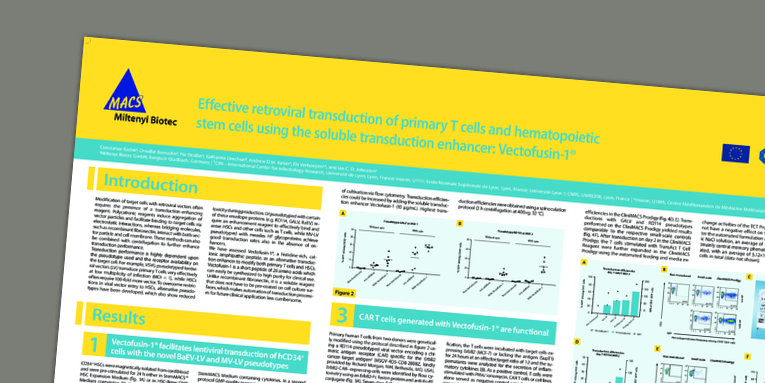 Boost viral transductions of hard-to-transduce cell types such as suspension cells using Vectofusin-1. The fully synthetic peptide offers a straight forward protocol which can be easily adopted from small to large volume transductions. Eliminating the need for pre-coating, Vectofusin-1 provides more flexibility in experiment planning and can be easily integrated into automated processes. Vectofusin-1 is available in MACS® GMP grade.